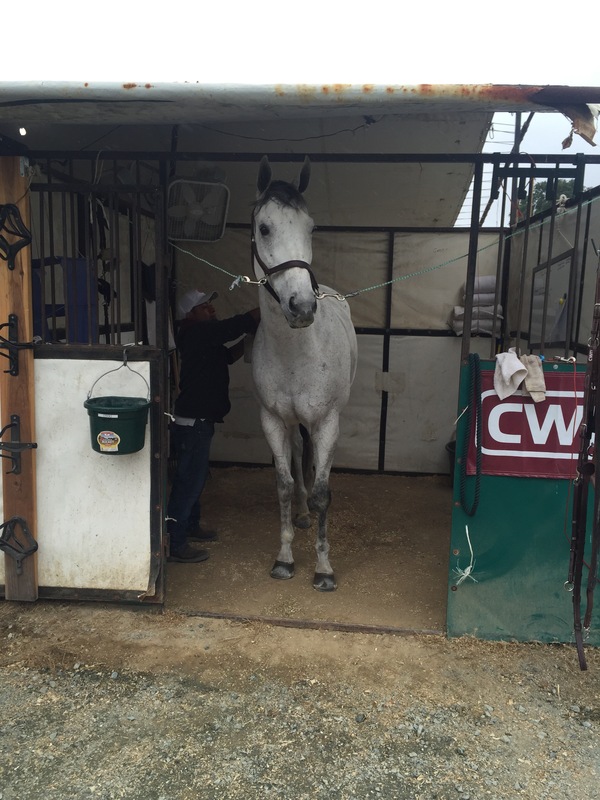 Get to the show and say good morning to my mighty steed and see what kind of mood he is in. He looks rested and ready to go. No good morning greeting would be complete without a carrot. I always give him a carrot every morning of a horse show (a well placed bribe if you will). Then it’s off to the ring to study my course and watch some people go. Now it’s warm up time. He was defiantly stoked to be at a show again and was jumping around great. All my distances were showing up and we were clicking. As I’m walking towards the ring I go over my course one more time and surprisingly I don’t feel very nervous and that is unusual for me. So we are in and cruising he is a little amped and needs some little reminders to wait for the spot to show up. But all goes well and we make the jump off. The buzzer rings out and we have 45 seconds to get to the first jump of the jump off. 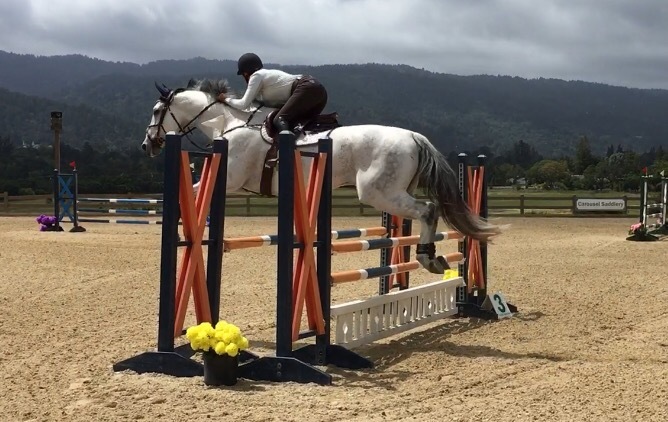 He has settled by this time and things are going great until I pull him mid air to the side (I was thinking I was going to splice it but should have positioned him for it before the jump not during the jump). So we got a rail and it was all on me. But ended up 8th out of 18. Few hours break then back for the meters. He is even more settled and focused these two rounds but a bad spot to the second jump gets us a rail and we end up 8th. Next meter is a speed round and we cruise around and everything is great but get a rail on the second to last jump. Didn’t even know it came down until the announcer called it. It was very windy so I couldn’t hear the rail falling. BUT we were the fastest 4 faulter and got 3rd out of 8. He seems pretty happy about the day. I always always give him carrots after our show rounds because I’m so greatful that he is so willing to do this for me and has a good attitude about it. He is all tucked in and we get to do the whole thing again tomorrow! I’ll keep you posted. Hey guys, so I wasn’t able to get any video of our 2nd to last lesson before we head out to the show but I did get footage of my last lesson. OK so lesson two went really really well. We jump 3’3 to 3’6 courses and for the most part did great. Yes I was still floppy when I saw my spot but this close to a show there is nothing I can do about it. Not a good time to really focus on changing a long running habit. But my distances were showing up and Greyson had so much fun being jumped up and getting to go into “jumper mode”. He looked so pleased with himself afterwards. Sorry it has been so long since I posted an update. 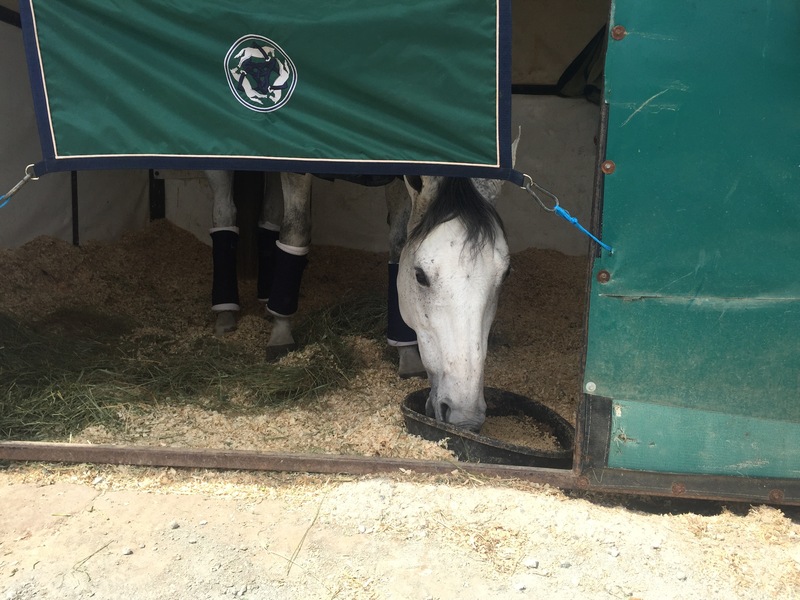 I had a case of writers block but it’s all good because getting ready for a horse show has given me something interesting to write about. Our first show of the season is rapidly approaching which means I only have so many rides left to practice before the show and I need to make the most out of each one. Lesson one of three happened last Thursday and we were stuck in the indoor arena due to rain. And when we do lessons in the indoor we are limited to 3-4 jumps. Luckily my trainer knows how to keep things interesting and we worked on a cloverleaf pattern. 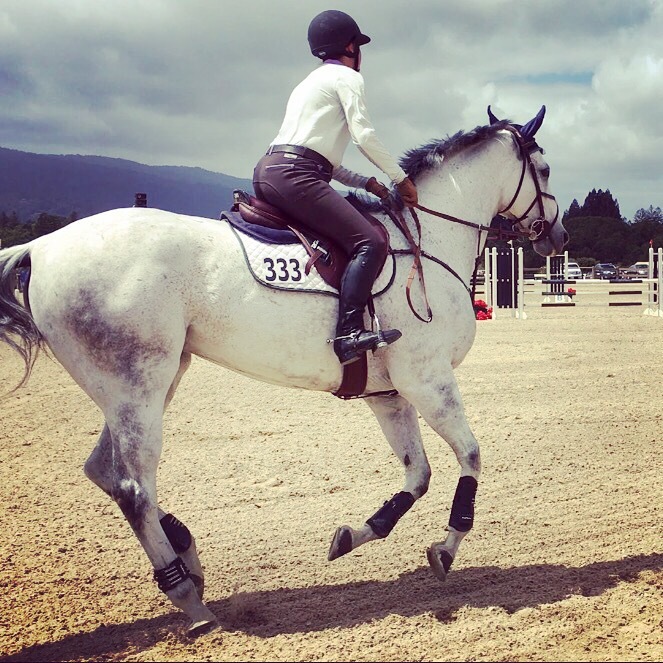 I compete in jumpers so practicing making turns while keeping my power will come in useful for the jump offs. Keeping my leg tight when I see my distance. 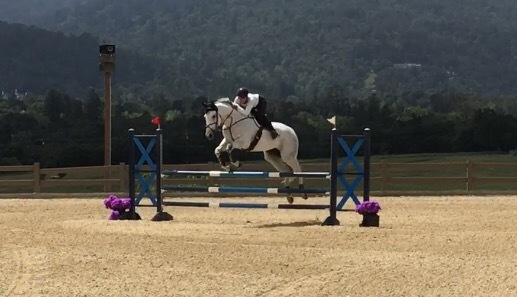 You can see in the video going to the last fence I get extremely floppy. This is my worst habit that I am working on overcoming. Every time I concentrate on try to fix it I will miss my distance and Greyson will have to bail me out. Staying straight and light to the fences. Sometimes I will hold my inside rein a tad strongly resulting in Greyson’s nose being a little off center which means he needs to work harder to keep rails up. Two more lessons until we leave for the Woodside Spring Preview. So excited to get back out there and show again! Planning on blogging behind the scenes stuff at the show so stay tuned for that.